Our product range includes a wide range of fastplug -seed starter plugs 30 mm and fastplug seed starter plugs- 40 mm. Fastplug(TM) Seed Starter Plugs 30 mm is a seed starter plug used as the medium for germinating seeds or cuttings and for rooting. They provide required aeration and moisture retention for successful plant propagation. We provide plugs which include coco peat as the raw material. FastPlug(TM) is a seed starter plug used as medium for germinating seeds or cuttings and for rooting. They provide required aeration and moisture retention for successful plant propagation. 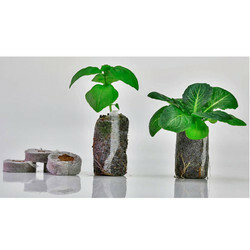 We provide plugs which include coco peat as the raw material. Looking for Cocopeat Grow Coins ?